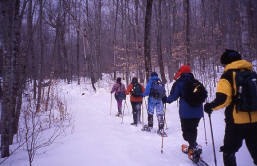 Snowshoe in the heart of The Adirondacks High Peaks Region! Set in Keene Valley surrounded by the High Peaks, the number of wilderness trails are endless and the snow is plentiful. Each day's outing covers 3-6 miles depending on conditions, abilities and preferences. We trek up the Ausable River with it's icy waterfalls along the way; Climb to an overlook to view an unexcelled panorama of the High Peaks; Hike to Copperas Pond below Whiteface Mountain; Snowshoe a section of the Jackrabbit Trail; and many other options. All the while, the views of the mountains and fresh air will take your breath away for a truly memorable experience! We stay at a cozy and quiet inn near Keene Valley in the heart of the High Peaks Region, where camaraderie, comfort and great food are hallmarks and that has ski trails right out the door. Then sit by the glow of the fireplace as you recall a satisfying day in the crisp outdoors. We'll also travel to Lake Placid to see the Winter Olympic Center complex to watch the bobsledding and luge runs, and dine out at fine area restaurants. Snowshoes and poles are provided if you need them.